Michael Singer and Linnea Glatt were hired as artists by the Phoenix Arts Commission and the Department of Public Works to provide the conceptual design for the 27th Avenue Solid Waste Transfer and Recycling Center. The project, a 100,000 square foot facility on 25 acres, transformed an “out-of-sight, out-of-mind” piece of infrastructure into a dynamic facility that stands out proudly within the city’s landscape. At the forefront of the design was the mission to create an aesthetically beautiful and functional facility that would engage the public to promote recycling while simultaneously creating a sense of communal pride in this critical piece of civic infrastructure. This project was a key development in promoting transparency within infrastructural facilities for the purpose of informing the public and ultimately influencing behavior regarding waste disposal and recycling. Due to the success of projects like the 27th Avenue project, today it is common for educational programs to take place within similar facilities around the nation. Infrastructural transparency, engagement and educational programs help to increase rates of recycling and reduce the improper disposal of environmentally hazardous materials. 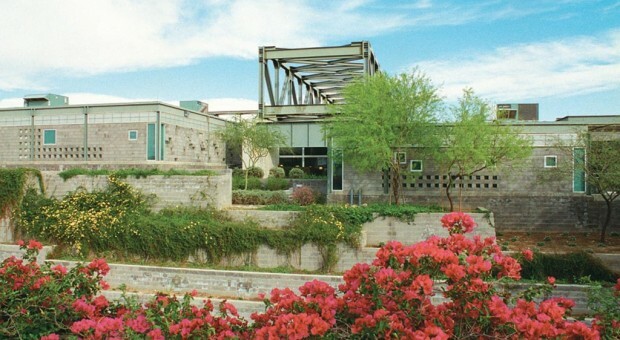 Phoenix’s 27th Avenue facility has become a well-known national model that has won several awards, was featured in many publications and is credited with promoting aesthetic design excellence for infrastructure in the US. The New York Times chose the project as one of the eight most important architectural events of the year in which it was built. Critically, the facility also helped gain public acceptance for the Phoenix Department of Public Works siting of other waste transfer and recycling facilities in communities throughout the city and the metropolitan area. Renewal, innovation and transformation were the key concepts behind the re-thinking of the 27th Avenue project. The engineering site plan was re-imagined to improve truck and small vehicle circulation patterns, move the self-haul area closer to the visitor’s center, balance earthwork cut and fill and expand and integrate landscape areas with the main building as terraces and courtyards. In the process of designing the facility the team reworked the structural strategy for the building eliminating all but one central interior column and replacing them with exterior support columns and trusses. This interior flexibility turned out to be critical as the Department of Public Works replaced the original sorting machinery with an advanced and fully automated system to meet the unexpectedly large volume of recyclable waste coming to the facility. The building core where the recycling takes place was fitted with numerous skylights with solar tracking mirrors to optimize daylighting. The facility design also added a multipurpose community room, laboratory, viewing galleries, exhibition spaces and office spaces for private and nonprofit organizations. While the project was once derided as a Taj Mahal of trash, the facility was actually completed for $4.5 million less than the original engineering plan budget. One of the New York Times articles can be read here. Engineering and Construction Management: Black and Veatch, Inc.